* It's been a cracking World Cup so far, certainly the best one that Macro Man can recall watching. The matches have been tense, the football's been attacking and largely enjoyable to watch, and as one mate said yesterday, there have only been a few truly crap teams: Cameroon, Honduras, and...er....England. * One wonders if Mario Draghi had to make some sort of sacrifice to the football gods to save the Eurozone in 2012. At the time of writing, all core/semi core Eurozone countries are still in the competition (Germany, Netherlands, France, Belgium, plus uber-hard currency Switzerland), while all the peripheral crisis countries (Greece, Spain, Portugal, and Italy) are out of the tournament. * The good news for US markets is that it's a short week due to the July 4th holiday. The bad news is that there is one less day than usual for stocks to rally. * It's nice of the Fed to concede that they observe 'frothiness' in leveraged loans and farmland. Unfortunately, it seems as if the Fed staffers charged with surveying the rest of the financial markets are actually the "see no evil/hear no evil" monkeys. 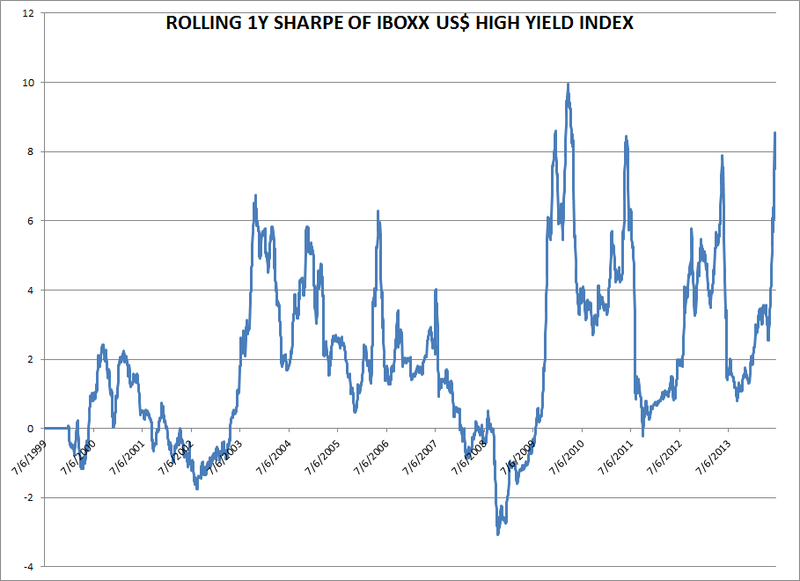 Did you know that the one year Sharpe ratio of the Iboxx US$ high yield index is roughly 8? As the chart below illustrates, the rolling 1 year Sharpe of the HY index has approached that level 3 previous times since the crisis (never having been anywhere close to it before the crisis, mind you.) On each occasion, the risk adjusted return moved swiftly lower. Caveat emptor. England supporters don't have mates, MM. Innit.